If you are missing one of these key components, you may need to adjust the activity itself or consider the sensory motor components necessary for core activation. Only one of these girls is benefiting from this activity. Consider this ball walk-out activity. This can be a beneficial activity for core activation, upper extremity strengthening, and weight bearing in preparation for fine-motor/tabletop activities. At first glance, both girls appear to be executing this activity. Yet further analysis, based upon the aforementioned criteria, reveals only one of the two is truly benefiting from this activity. If we examine the position of the young lady on the right, we can see that she is not able to maintain rib cage and pelvic alignment as demonstrated by an exaggerated lumbar curve and flared ribs. This position will limit her ability to activate the deep core with breath, (Hodges). 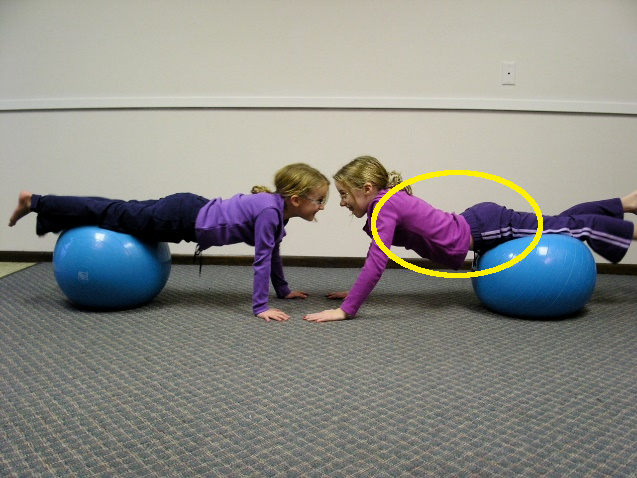 Similarly, we can see that she is also demonstrating a fixing pattern with her shoulders elevated. During core strengthening activities, it is important to observe the spinal curves. Generally, soft neutral spinal curves will be present when the deep core muscles of the back are activated. Any excessive angles in the spine, such as extreme lumbar lordosis, neck hyperextension, or kyphosis indicate a lack of core activation. Breath is the key entry point for dynamic postural stability. Many of our clients hold their breath, as well as, have restricted movement of the diaphragm. With this knowledge, we can presume that the young lady on the right is not demonstrating a fluid breath with 3-D expansion of her rib cage. Undoubtedly this activity is not supporting core activation for the client on the right and needs to be adjusted. One immediate option would be to adjust the activity set-up by moving the ball further up her body towards her pelvis, as well as engage her in playful vocalizations. This would provide greater postural support and proprioceptive activation of the breath. With these simple adjustments we anticipate our client will assume closer to ideal alignment, as evidenced by the alignment of her rib cage and her pelvis with adequate respiratory support, which in turn will support the activation strengthening of the postural core. However, if she continues to lack proper alignment and respiratory support then the therapist must consider other options. An alternative before moving on to this specific strengthening activity (ball walk out), is to consider the underlying sensory motor and developmental components necessary to turn-on the core. By introducing a precise combination of core activating ‘Power Ups’, you lay foundation for later balancing and strengthening. Begin with overall activation of the whole system through various sensory motor pathways: auditory, vestibular, visual, proprioception, and respiratory. Additionally, beyond just considering the unique contributions of each sensory system, therapists must also investigate the unfolding of the primary movement patterns. These early movement patterns underlie the development of more mature postural and movement patterns. In order to fully develop, early hardwired reflexes require adequate sensory processing and early life experiences that are rich in movement. Any circumstances early in life that limit sensory processing and/or movement experiences may ultimately impact core development. Therapists can use specific music (such as Quickshifts or Therapeutic Listening® modulated music) to provide a rhythmical template to organize motor output and/or to trigger the orienting response which activates the core postural muscles. Gravitational Grape, Bilateral Integration, and Motor Organization may be ideal Quickshift selections prior to core activities. Equally important is to provide precise vestibular input to all five receptors by introducing a variety of linear and rotary activities (consider direction, speed, rhythm, and duration of input). For vestibular activities, consider head placement relative to the field of gravity to ensure that the head is moving through all planes and does not remain only in the upright. Finally therapists should incorporate activities that focus on deepening the breath by grading and elongating the exhale, as individuals with core activation difficulties often use breath-holding for stability. Kazoos, bubble tubs, resistance to rolling, and power sounds (“ha” and “sss”) can all easily be incorporated into various treatment activities to increase depth of breath. Once the core is activated, it is important to address sustained holding of basic anti-gravity positions to strengthen and integrate these patterns into the individual’s movement repertoire. Individuals with postural difficulties often have an imbalance or lack of activation of these early movement patterns that underlie core development: anti-gravity extension and flexion, lateral flexion, and rotation. Consider the surface on which your client is required to hold. Initially strengthening is best accomplished on a stable surface (mats) prior to working on a dynamic surface (gym ball). Once the client is able to maintain anti-gravity postures, the therapist may then incorporate resistance and playfully challenge holding for a sustained period of time (use of gravity, manual resistance, and even challenges with the therapist). From time to time, observing core activation and spinal alignment can be challenging with kids who are very skilled at moving in quick, bursts of movement. With parent permission, video and picture analysis can offer another window into learning and assessment as a means to select precise therapeutic strategies and interventions. If you are interested in obtaining additional information and practical applications regarding the sensory motor contributions to postural core analysis and activation, please join us for our hands-on, activity oriented treatment course: Core Connections. Frick, S., OTR, & Kawar, M., M.S. OTR. (2004). Core Concepts in Action. Madison, WI: Vital Links. Frick, S., OTR & Young, S. PhD. (2009). Listening with the Whole Body: Clinical concepts and treatment guidelines for Therapeutic Listening. Madison, WI: Vital Links. Hodges, P. & Gandevia, S. (2000). Changes in intra-abdominal pressure during postural and respiratory activation of the human diaphragm. Journal of the American Physiological Society. 89: 967-976. Kawar, M., M.S., OTR, Frick, S., OTR., & Frick, R. (2005). Astronaut Training: A Sound Activated Vestibular-Visual Protocol. Madison, WI: Vital Links. Thank you for this beautifully articulated and succinctly captured essential message! Love your brilliant work!